Unwatchable. I always find it a challenge. What makes a film unwatchable? Does just being slow or uninteresting making something unwatchable? Shoddily made? Self aggrandizing? Racist, sexist, or cruel? Are any of these qualities that automatically make something unwatchable? My overriding movie philosophy is that every film, no matter how derided, can potentially contain something, even just a moment, that connects or astounds in its own way. Theodore Rex put that philosophy to the test for sure. I've never really met anything so odd and wrong-headed that was so difficult to focus on at the same time. "Is that a tail or are you happy to se- oh, wait. Yeah, it is a tail." Theodore Rex exists in a strange future where dinosaurs have been resurrected and now live among humans. One such dinosaur, Rex is a glorified tour guide for the Grid Police. When a dinosaur winds up dead, the police assign Rex the case with the gruff but unlovable, Coltrane (Whoopi Goldberg). The two of them wander from scene to scene ostensibly finding clues, but mostly just annoying one another. Eventually they uncover a conspiracy to throw the world back to the ice age and destroy humans and dinosaurs alike. Theodore Rex is a textbook case in how not to engage in world building. Nothing presented in the film flows from any kind of logic or consistency. The environment takes much of its inspiration from Blade Runner (1982), but where as that film shows a world that could plausibly give birth to Replicants, the Grid of Theodore Rex is just a smashed together mess that looks like Batman Forever (1993) had an illicit child with Demolition Man (1993). There's no reason to anything, why dinosaurs exist again, why they are human sized, why they can speak and wear clothes, how they fit into this word, and why the monomania with recycling? Tonally the movie flips between overly goofy children's movie and PG-13 action film. The humor struggles to prove itself and barely ekes out a few sight gags and fart jokes. The action is standard and uninspired 90's shoot 'em up mush. In a way, it's an aesthetic that goes hand in hand with the cartoonish look of the dinosaurs as they stumble about awkwardly among the grim yet colorful SF trappings. New Line Cinema's legal team brings Whoopi to the set. The puppetry of the dinosaurs is passable, although the overall design of them leaves a lot to be desired. Whoopi Goldberg obviously doesn't care about anything that is happening, and given that she was contractually forced to do the film, who can blame her? I've never understood the reasoning behind putting her in action roles, she can bring a charismatic energy to a performance, but she just seems awkward shooting big gun and punching people. Theodore Rex isn't unwatchable, but it comes damn close. As a film, it fails in every way and my only real emotional response was feeling bad for character actor Stephen McHattie as he tries to throw out some menace behind a blue trench coat and silly long wig. 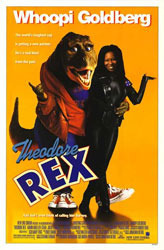 Theodore Rex only becomes notable when you take a step back and realize that this film got made. People showed up to work every day, sweated and tried to create this thing, only to produce something that such a colossal disaster.